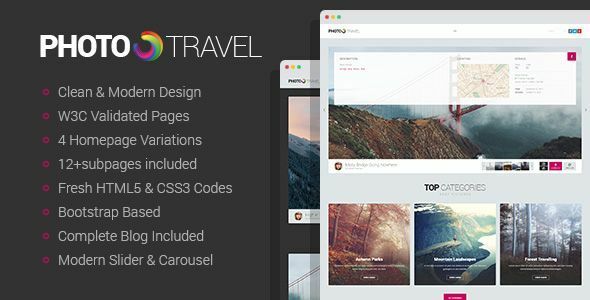 PhotoTravel is a premium Bootstrap theme crafted for travelers and photographers with love and care. The theme provides great options to arrange the photos from your trip and showcase your talent at it’s best. Originally the theme was inspired by PhotoTrvl – great Photo plugin adding more value to your photos. We’ve customized original idea and backed up great functionality with best design practices. Using this templates allows to add more information to your photos and connect them with special places and custom information. The theme will suit other niches as well. PhotoTravel would be a great solution If you are building photo portfolio, adventure log, wedding website or any other creative solution.